There’s nothing like a leisurely walk through a rose garden in full bloom. Vivid colors and a sweet rose fragrance beckon you into a garden alive with romance and Japanese beetles…WAIT! WHAT? 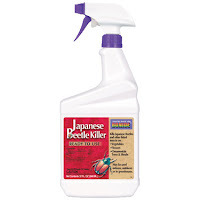 There are few things that will frustrate the home rosarian more than Japanese beetles. So what are we to do? Before you head out into your garden with your handy flame thrower, let’s take a quick look at some options for keeping these unwelcome garden guests under control. Option 1: Cut your blooms early and bring them inside! How easy is that! Japanese Beetles are drawn to color and fragrance, so if the color and fragrance are in your home instead of your garden, the Beetles will head elsewhere to find sustenance. One thing to remember when cutting your blooms early is to make sure the sepals have fallen; otherwise you will have a beautiful bud, which never opens, sitting in a vase until it droops into oblivion. So break out all of your vases and get ready to arrange to your heart's content! I know! Just keep in mind they don’t bite! Head out early in the morning when the beetles are sluggish. (They are probably hungover from all of the sweet roses they noshed on the day before… jerks.) 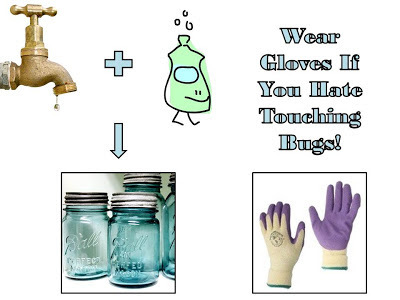 Hold a jar full of soapy water under the bloom and shake the beetles off into the jar. The soap breaks the surface tension of the water so the beetles drown. 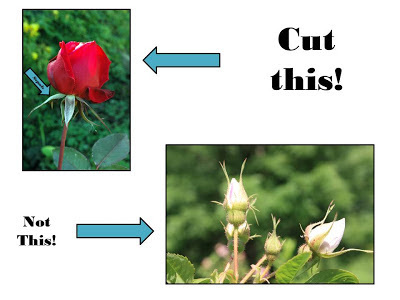 I know it seems gruesome, but your plants will be skeletonized if you do nothing! So keep that in mind! This one is pretty self-explanatory right? You spray the chemical and the bugs go away. To an extent this is true! However, the spray does not prevent Japanese Beetles, it merely kills the ones that are already chowing down on your bushes! This is a good option if you are squeamish about touching the beetles, but you have to be consistent with spraying! 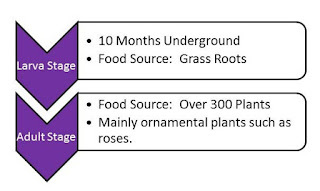 Option 4: Milky Spore Milky spore is a soil dwelling bacteria that infects the beetles in their larval stage. Even though you cannot SEE the Japanese Beetles when they are in the larval stage, they are still underground feasting on your grass roots! 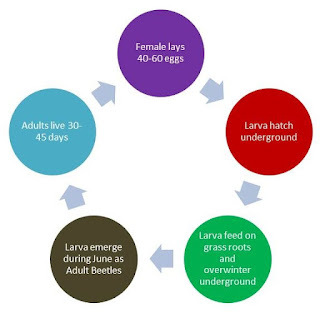 While applications of Milky Spore will decrease the number of grubs that survive in your yard, if your neighbors are not treating their yards, it can be fruitless! I know it is tempting to place one of the Japanese Beetle bag traps in your yard, but resist the urge! It does such a great job of luring beetles to it, that it will attract even more beetles into your yard! Just think about it! If you are trying to get the color and fragrance out of your garden in order to discourage the beetles from devouring your garden, why would you place a colorful bag with a floral lure to draw them back in? Now if you could convince your neighbor to hang one in their yard…well... you get the idea! Japanese Beetles emerge from the ground in June and they only live 30-45 days above ground. While the beetles can be spotted anytime between June and October, the main “season” lasts only six weeks. It may seem like an eternity if your roses are being devoured, but have hope! Your roses will grow back!